In my experience the Grey River is never grey. It can be a surging brown turmoil of a river after rain, or a deep pounamu green when it is calm. When I tell people I grew up on the West Coast they invariably ask about the weather, “Is it always raining?”. So I tell them about 1988: it was a year that stood out for me for two reasons. First, because I decided to ride my bike to school rather than catch the bus, and in my memory I stuck to that decision firmly all year. Second, there were two ‘highest ever’ floods that year, one in May and one in September, and in the memory of this then-12-year-old it rained every single day in between. As a family we discussed where we might move to, we particularly favoured places we had never been, which always basked under a shining sun on the TV weather forecast, like Gisborne, or Kaitaia. It was lovely to dream of what our life might be like in those sunny paradises. People love this story, because it confirms what they already believe, and who am I to put them wrong? But it does seem to be common with this region; people often misunderstand it, wilfully or otherwise. In the last few years a number of younger photographers with ties to the West Coast region have turned their cameras towards it. Either returning home, or revisiting a region that has resonance for them. Myself, Mitchell Bright, Julia Johnston, Jake Mein, and Hannah Watkinson have all made projects on the West Coast. I asked them all what draws them there and they all profess a difficulty in articulating it. Bright says, “The landscape there is so immense it can be overwhelming, but that is what keeps drawing me back. How insignificant you can feel surrounded by mountains. My interest also lies in the tension between the landscape and the human presence within it.” I get that. I’ve often thought that on the Coast it’s harder to forget that at any moment the land might just throw you off, or if you don’t pay attention the bush will creep in and reclaim what you thought was yours. In other parts of the South Island the sky is huge, the land is immense and sweeping. But on the Coast the thick, dark bush is omnipresent and you are pushed up between the surging Tasman Sea and the towering Southern Alps, carving yourself a place and then working to hold it; a prospect at once terrifying and exhilarating. I was born in Greymouth, and lived there until I was 18 and ready to run away to university. My own photographic fascination with the region began with a desire to return about 17 years later. I ruminated on several projects before actually starting one unexpectedly, at the ghost town Waiuta while at home on holiday for Christmas in 2011. A casual day trip awakened a fascination with the history of the region, and began the project No Town which explored extant mining towns, ranging from Denniston north of Westport to the twin towns of Stafford and Goldsborough near Kumara. Since then I have explored traces of 19th c. gold mining left in the landscape in Homewardbounder, and concentrated more specifically on one historic town in Waiuta, which comprises images of a model village of the town in 1951 alongside photos of the town site now and historic photographs by Joseph Divis and James Ring of the town in its heyday. I have also collaborated with landscape photographer Shaun Matthews on the exhibition Prospects Fearful about the ill-fated 1846 journey from Nelson into the West Coast made by Thomas Brunner and his guides Kehu and Pikiwati (and the guide’s wives). The history of the region is key for me. I see the boom and bust history of the West Coast as a microcosm of the wider world – the same story could be told about hundreds of places in multiple countries. I am fascinated by the motivation of people who move around the world in hope of a better life. I am also interested how that pioneering spirit coalesces within a community over generations into protectionism, particularly when one’s own history isn’t well understood. But I am also both in awe and wary of the landscape. The land itself is a central character in this story, one that is sometimes overlooked yet ominously always present. West Coasters know the danger inherent in the land, what happens when you dig tunnels into it, or chop giant trees down. Earthquakes shook things up here long before Canterbury. Mining, forestry and fishing are a long-term game of chicken played with the natural world. With so much of our country’s economy reliant on natural resources, while at the same time more and more of the population becoming urban, the divide between cities and regions has never been sharper. Despite not having lived there for 25 years, the West Coast is still home for me. Or it’s one of them. A lot of the reason why I feel drawn to photograph there is in some sort of search for a sense of belonging. Jake Mein tells me that his reasons for photographing there have changed. At first, he thought he was interested in the emptiness, the way the place at first glance feels limited and lonely. However, once he started working there he realised he was making work about home and identity; his own and others. About how people find remote spaces for themselves and somehow become a more intense version of themselves in the isolation than they would have been in a city. Jake started photographing around Westport a decade ago, and those images formed the backbone of his book Six for Gold (Bad News Books, 2017). His father is from Westport, and while Jake grew up in Christchurch, his parents had a bach at Cape Foulwind where they would go every summer. As a teenager Jake (like myself) was repelled by the apparent isolation, wanting to be closer to the action of bigger cities. He began to be drawn back as an adult, largely due to wanting to connect with family who still live in the area. More recently, Jake has been working on the project Ashes (working title) in and around Westport, which he started at the PARALLEL Intersection at the Organ Vida International Photography Festival in Zagreb, and will be shown at the Robert Capa Centre in Budapest in September. Still in progress, he initially planned the series to be about the loss of industry in the Westport region, but as he has moved through it the work has become more personal, more about who his subjects are and where their place in the world is. Among the photos is a portrait of Jake’s great uncle Bill. We see him seated in front of the show jumping ribbons he won in the 1960’s and 70’s. A beautiful piece of vernacular décor in itself hung on a wooden panelled wall, as a backdrop for a portrait it shines with the narrative of life in a small community. Bill was one of the earliest workers at the Holcim cement works which closed last year, and was also one of the first to move into company houses across the road. In another image we see a bedroom in this home, warm sunlight falls through venetian blinds illuminating the room. Jake’s photographs have a deep warmth to them, even when he is photographing the semi-demolished cement works, the light is warm and we are shown genuine affection for this place. Jake has also photographed Jennifer Brownlee, a former landscaper for the cement works and Johnny Curry, a former logger who lives in the remote hills behind the gold rush boom town Charleston. We see Curry with his dogs, his truck and his axe, revelling in his self-determined life. Brownlee is in her kitchen, pickling and chopping cabbage with arthritic hands, her fingers carrying reminders of the years of labour for a company that left town when it suited them. Mein’s skill is in the combination of composition, colour and great lighting. His use of natural light and shadow is masterful, the softness of evening light juxtaposed with the harshness of summer sunlight. He takes this a step further by throwing in flash, illuminating people, rooms and plants with equal ferocity. What pulls them together is the depth of colour, the attention to detail and the heart in the photographs. Having moved away to Christchurch as a 10-year-old, for Julia this project is also a return home. Consisting mostly of portraits of the residents and their homes, but with the dramatic landscape as a backdrop, Coast Roaders makes no claim to be impartial or unbiased. Julia clearly has affection for these folk, she tells me she wants to capture both the originals who came in the 1970s and stayed, as well as their families, and others who have come to join since. We see Grae in his studio at Tiropahi, and Dan in his caravan at Barrytown, two generations making unusual spaces their own. The spaces themselves come to the fore too such as in Robbie’s House, 9 Mile. The image captions always include the place, important in this spinal neighbourhood. I imagine Grae and Dan meeting Robbie in the Barrytown pub: “Where are you living now?” “Oh, I’m up 9 Mile”. Julia’s photographs put me inside this community, they take me up hidden driveways I’ve passed numerous times and wondered what they are hiding. Her photos also take me outside into the world; we go whitebaiting with John at the Pororari River, the late afternoon light touching the always impressive Punakaiki bluffs behind him as he waits in his waders for his dinner to swim into the net. 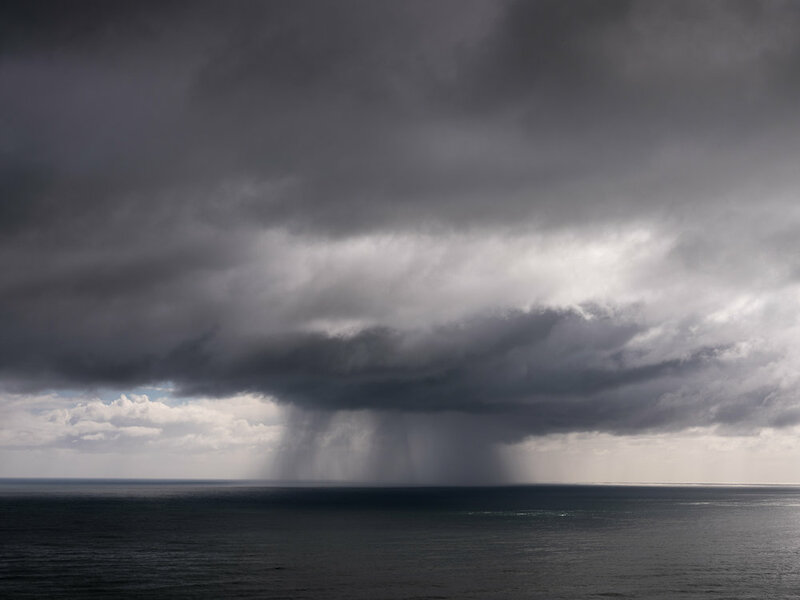 In Storm over Tasman, 11 Mile, I am reminded of my childhood a few kilometres further south, watching weather approach over the Tasman Sea from the safety of a warm, dry house. Always the weather. Coast Roaders is classic place-based documentary, it knows its subject and holds firmly to it producing a tight piece of storytelling. Mitchell Bright’s work Within the Land is more wide-ranging. Based loosely in the area near his family bach at Atarau in the Grey Valley, this project was made in 2015 while in his 4th year at Ilam School of Fine Arts. Mitchell grew up in Canterbury but spent holidays in family bachs, first at Punakaiki then Atarau. Mitchell says: “Here we had acres and acres of land and trees to get lost in with a river flowing along our boundary. This is where I remember my time as a child most, making huts in the forests, catching freshwater crays in the creeks and helping my family plant trees.” Within the Land suggests even in the title that our relationship to the land is paramount, that we live in it, not on it. Mitchell includes evidence of industry, photographing gold mines and saw mills, but also a rugby field at Blackball and the Reefton skate park. The linking of industry and recreation, weaving in portraits of locals and their homes, tells a story of a community with nuanced values and worldviews. Hannah Watkinson’s project The Near Future also grapples with the identity of West Coasters. She writes: “Embedded within the socio-cultural understanding of a place, these photographs attempt to use the medium to describe something of the psychological landscape of the region – the invisible structures of economics and politics that define the place’s history”. The Near Future was also a project started over Hannah’s 4th and Honours years at Ilam School of Art in 2015/16. Engaging more clearly than any of the other projects featured here in the contemporary state of industry in the region it is wide ranging in its scope. Hannah photographed the Holcim Cement Works in Westport before they closed (only 3 years before Jake photographed them after closure), the gates to Pike River mine, railway workers, historic sites at Denniston, Waiuta and the Brunner Mine, the Stockton Mine, forestry and dairy farming. Hannah is clever with light, giving dry industrial sites a wash of sunset hues in a Joel Meyerowitz Cape Light kind of fashion. But the West Coast isn’t Cape Cod, the warm, optimistic light is at odds with the subject matter which is given a sheen it wouldn’t usually have. Some of Hannah’s most striking images are a little more esoteric – and humourous. One of my favourite of her photographs is an image of a road, with a large tree backlit by golden afternoon sun. Across the road from the tree is a yellow road sign, pointing directly at it. The sign reads ‘Large Matai Tree’ in a redundant fashion. Some Coasters would say this is a microcosm of the way the region is treated by the wider country, that a bureaucrat somewhere decides something but when the idea hits the ground it is rendered patently irrelevant. However sometimes decisions made locally aren’t so hot either. In Skate park or basketball court, Carters Beach, Westport, 2016 a rectangle of concrete, shiny with rain, appears to have an ill-planned dual purpose. Perhaps the new challenge on the West Coast is tourism, touted as the replacement to mining it is probably only another boom and bust industry which will leave its own wake. Hannah includes a photograph of the Bearded Miners, a couple of old fellas in Reefton who regale tourists with stories of the gold rush they are far too young to remember. What shines through in all these projects is the genuine affection all the photographers have for the region, even while pointing out the absurdities. Our relationship to the land and to industry is stretched and examined, without pretense, and kept as golden keepsakes. Some might see much of what has been photographed here as dereliction, and there is always the risk when photographing in this region of falling into the genre of photography that celebrates the ruined, abandoned or deserted. However, that type of photography often plucks buildings from their context, from their communities. The projects featured here all celebrate community, drawing wider attention to an often-overlooked part of the country. I would also argue that what to some eyes looks like dereliction might just be a fairly average West Coast building. The climate does mean that plants and lichen grow quickly, giving the impression of time passing more quickly than in other places. There is also an attitude here that if something is still useful, it is still of use. What you might think is a rundown old building might be somebody’s workshop, or even their home. The West Coast is a great place to be if you don’t want to engage in a ‘keeping up with the Joneses’ lifestyle. Other people will leave you alone if that’s what you want. We never did move in 1988, Kaitaia and Gisborne remained exotic idylls that were never realised. We waited it out, the year passed. The sun reappeared with the summer, and our lives returned to normal. They built a flood wall to contain the mighty pounamu-hued river and slowly the town rebuilt and moved on. I don’t know why we didn’t leave, possibly due to inertia, or perhaps because of my parent’s understanding of what we would be leaving behind. But also perhaps because of a feeling that we would be giving in, letting the weather beat us. So we dug in, we hunkered down, we weathered the storm. Because that’s what West Coasters do. You want to talk about the weather? Bring it on. 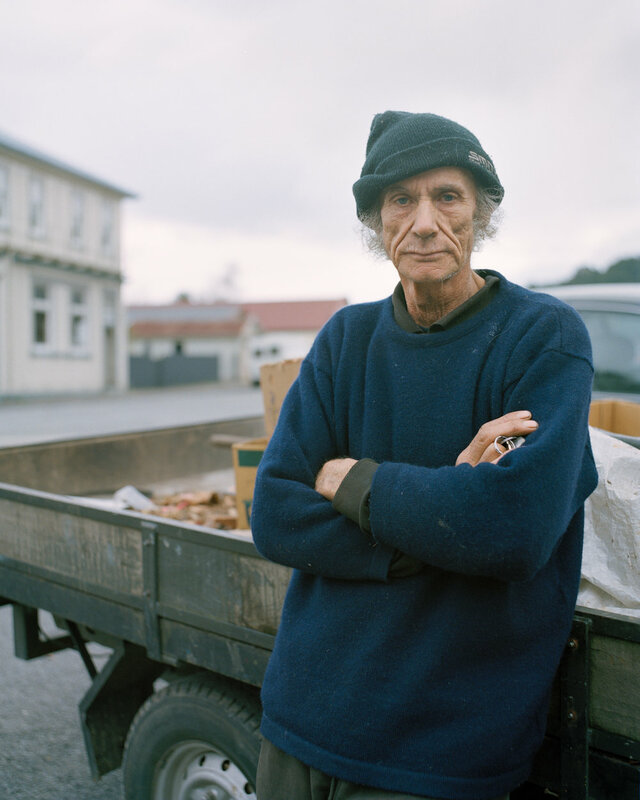 Caroline McQuarrie is a Lecturer in Photography at Whiti o Rehua School of Art, Massey University, Wellington. She is an artist whose focus is the concept of home, whether it is located in the domestic, the community or the land. I mentioned this to a local recently and she said ‘Didn’t it rain for 26 straight weekends?’ which feels about right to me. Other photographers such as Chris Corson-Scott have not been included here because while they photograph in the region, the region itself is not specifically the subject of their work. The Murchison earthquake in 1929 was magnitude 7.3 at 12km deep, it killed 17 people. The Inangahua earthquake in 1968 was magnitude 7.1 at 12km deep and killed 3 people. Hugh Campbell, ‘Real Men, Real Locals, and Real Workers: Realizing Masculinity in Small-town New Zealand’ in Country Boys: Masculinity and Rural Life, ed. Hugh Campbell, Michael Mayerfeld Bell, Margaret Finney (Pennsylvannia: The Pennsylvania State University Press, 2006), 90-91. Jessica Hubbard ‘On abandonment and other matters: a supposition’ in Homewardbounder (Wellington: Enjoy Public Art Gallery, 2014), 11-15.